If there’s any event worthy of being labeled as “relationship goals” or bookmarked to a folder titled “Wedding Inspo,” it’s the long-awaited nuptials of our very own, Jessyca and David Canal. From the rich culture to the antique, yet contemporary, ambiance surrounding the event, guests encountered the couple’s personalities in unique and amusing ways. Whoever said “the devil’s in the details,” clearly never met Jessyca, as every last detail down to the bar napkins perfectly embodied the couple and their theme in the most tasteful way. 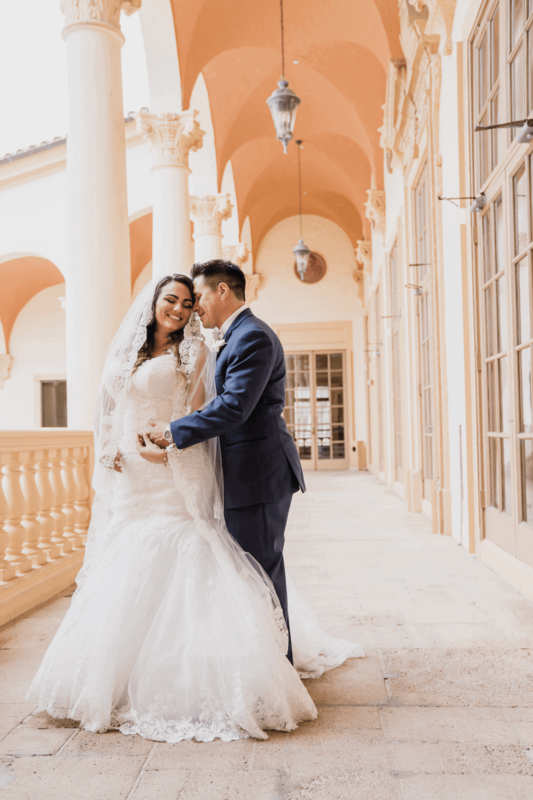 Sit back, and enjoy your trip around the world with the Canal’s as we dive into their travel and wine themed wedding. Oh, and grab a pen because these noteworthy details are sure to blow your mind! The beautiful, rustic architecture of the Coral Gables Women’s Club made the perfect location for the personality-filled event. Deep burgundy, classic gold, and accent greenery perfectly embodied the travel and wine theme, while the unique table features brought the couple’s charm out in the best way. Straying away from traditional table numbers, the Canal’s opted for table markers that categorized guests with various locations the couple has traveled to together. Each guest received a place card with their name, travel location, and a cork from a wine bottle that the couple enjoyed together to completely tie the theme together. This adorable twist to a traditional wedding detail successfully brought out the individuality of the event. Not only did the couple put their own twist on traditional wedding details, but they created a few of their own. The “Who Takes The Cake” detail is an innovative and charming way for guests to interact with each other and the wedding in a different and unusual way. A well-known and loved ritual when it’s time to cut the cake at weddings is for either the groom or the bride to get a hand full of cake to the face. With the “Who Takes The Cake” activity, guests pick whether the bride or groom get the coveted “cake to the face” simply by placing money in their desired jar. This money then goes to the “Honeymoon Fund,” making the donation not only exciting, but heartwarming as well. Another unique activity for guests was the “Build a Memory with Jenga” detail. This detail calls for the guests to write something wise, funny, or memorable on a Jenga piece so the couple can remember their perfect day for years and years to come each time they play. Paying homage to their heritage, a Cuban cigar roller and a Colombian band (the Vallenato Band) livened up the party even more with a cultural tribute to the bride and groom. Vintage books and cameras combined with the event’s Snapchat geofilters and social media hashtags encompassed the perfect cross between modern and old-fashioned travelers. There’s nothing like ending an exciting and memorable night than with your just deserts! C & B Sweet Designs really knocked it out of the park with their vintage dresser sweets table to tie the event together with wide array of pastries and other delicious treats. This DIY dresser found at GoodWill was sanded down and re-painted specially for the event. Jessyca even went as far to provide all platters, stands, and pearls from her own personal collection of decor. Organic Moments Photography brings us back to the special day with the breathtaking captures of memorable moments and every slight detail of the day. This was an unforgettable moment filled with beautiful and fun loving family and friends! Love you Mr. &. Mrs. Canal!